The Inuit lived along the eastern coast of Siberia and in Alaska, on both sides of the Bering Strait. (Some people call them the Eskimo, but that’s an insulting Algonquin word for them). The Inuit fished and hunted seals and walruses and caribou. About 1 AD, in the time of the Roman Empire, when the first emperors in Japan were starting to trade more with Han Dynasty China, East Asian traders started to sail up the Pacific coast to trade with the Inuit to their north. The traders bought fur and walrus ivory from the Inuit, and in exchange they sold the Inuit iron and maybe steel knives. Good steel from Central Asia was expensive even in China, and it must have been very valuable to the Inuit. With their new iron or steel knives and hooks and spearpoints, by 500 AD Inuit people started to hunt big whales. 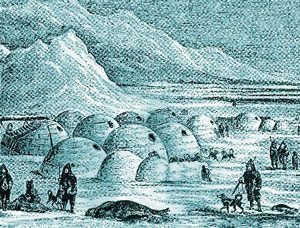 The Inuit used whalebones to build their houses.They also used their new weapons to fight with each other over trade rights, and they settled in bigger villages so they could control the traders and the places in the ocean where whales passed through, migrating south for the winter. They started to wear slatted armor like Chinese or Japanese armor, only made out of walrus ivory or bone instead of metal. Just before 1000 AD, unusually warm weather allowed Viking traders to settle in Greenland, looking for furs and ivory. 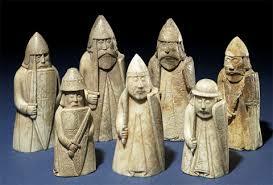 The first Vikings arrived in 986 AD, just as the Tuniit began to move southward into Greenland. The Inuit apparently heard rumors – maybe from their Tuniit neighbors – about these Vikings who, like East Asian traders, would buy furs and ivory and sell you iron knives. Inuit fur traders headed east across northern Canada, and many Inuit people settled in Labrador, Newfoundland, and Greenland. The Inuit used their dogs and boats and weapons to push aside the Tuniit people they found there. They also brought with them the Mongol recurved bow, which worked well for killing enemies as well as for hunting. But about 1350 AD this warmer weather ended and there was instead a period of colder weather called the Little Ice Age. Sailing from Greenland to Norway got harder with more danger from floating ice. At the same time, North Africans started to trade more with West Africa, where they could get higher quality elephant ivory. The Vikings slowly stopped trading with the Inuit. The Vikings abandoned their last settlement in Greenland soon after 1408 AD, just as the Inuit finished conquering Greenland from the Tuniit. Now there was nobody to sell Inuit furs and ivory to anymore, and no way to buy any more iron knives and spears. Tell your own Inuit stories! So the western Inuit moved into southern Greenland. It got too icy in the northern Arctic to hunt whales anymore, and without iron, the Inuit couldn’t hunt whales very well anyway. Without trade, the western Inuit were much poorer than they had been before. 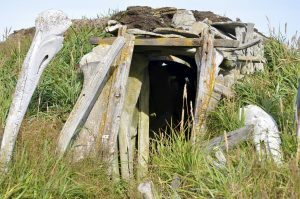 Instead of living in houses built out of sod (dirt) and whalebone, they had to move more and more often looking for food, and lived in sealskin tents or in igloos built of snow a lot of the time. Soon the Atlantic Inuit started to move south, looking for places where there was more food to eat. By 1500 AD, the Inuit were beginning to move into southern Labrador, near Newfoundland (which is still pretty far north). In the east, though – in Siberia and Alaska – the Inuit kept right on trading furs and ivory for iron knives. Cite this page: Carr, K.E. Inuit history – Native Americans. Quatr.us Study Guides, August 9, 2017. Web. April 25, 2019.